The annual peer review conducted by the Norwegian Financial daily, Finansavisen, was published 15 February. 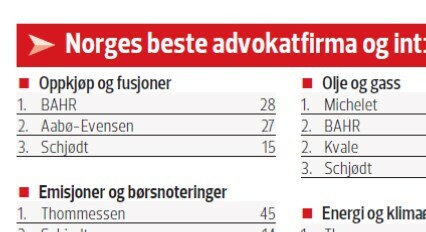 Aabø-Evensen & Co is once again ranked as one of Norway's leading M&A Law firms. 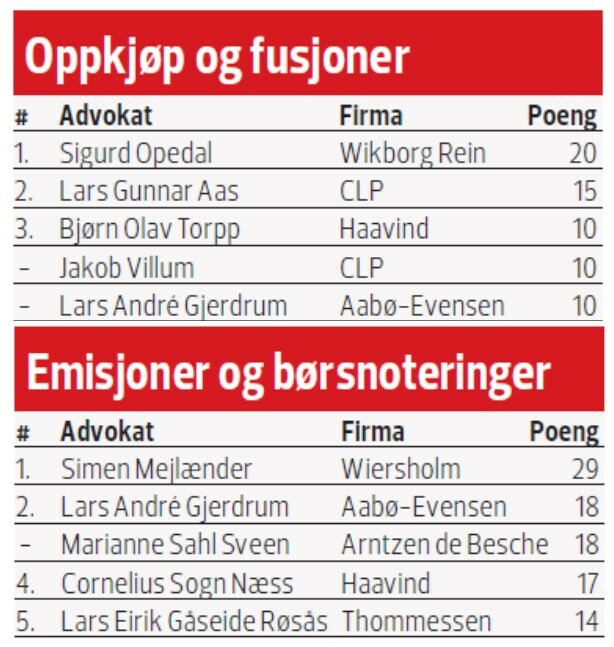 Personally I am very grateful to be ranked by our peers as No 1 M&A lawyer in Norway, and to see my partner colleague Lars André Gjerdrum ranked as No 3 on the M&A up and coming list and as No 2 on the Capital Markets & IPO up and coming list, and not least that our firm being ranked as No 2 M&A law firm, just 1 point behind BAHR. First and foremost, this is an acknowledgement of the consistent efforts made by our team. Many thanks to all our colleagues that voted for us" says Ole Kristian Aabø-Evensen. To see the peer review in its entirety, please visit http://www.finansavisen.no/ to request a copy or click here to see the mentioned section of the survey.